It’s not everyday you get something this dramatic nearly on your doorstep is it? Three 20+ story tower blocks all being blown up at the same time, how could you not go for a look, especially if you’re a photographer. 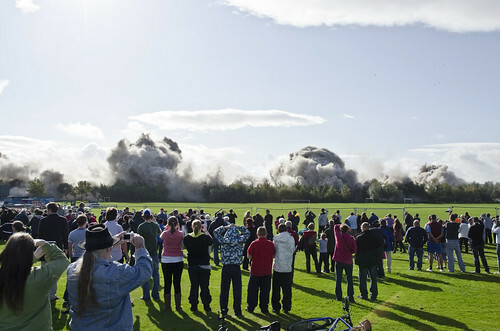 This was the 2nd controlled demolition in Sighthill in this area, the last one about 2 years ago I spectacularly badly timed and realised right at the moment I was still in the house when I heard the boom. Not long after that, 3 similar blocks came down in Gracemount in Edinburgh but there wasn’t particularly good access to that one so I ended up catching it from around 2 miles away on Blackford Hill where you really lost any of the drama of the event. For this one though, plans had to be made. Finding the website of the company doing the demolition, Safedem, was the perfect start, all the planned timings were on there, along with road closures etc. With this info in the bag, it was time for a quick scout around the area looking for a vantage point. The exclusion zone though was a problem and to get a view with nothing in the way Sighthill Park was the only realistic option. This gave the possibility of an added dimension of being the main spectator area hence, the chance to catch crowd reaction to the event as well. Getting to the location was not a huge issue, living nearby I know the area well and parked up in Broomhouse and 5 minute walk had me in Sighthill Park just at 11am. Amazingly for Edinburgh, the sun was out and just to the left of the flats which was an issue, try to get all 3 in 1 shot and you also got the sun and flares regardless of how you did it. Options were to move further to the left but that restricted the view so I decided to go for each one individually. I knew there would be a couple of second’s gap in-between each but which one of the 3 to focus on? As the warning explosion was set off I took a gamble on Hermiston Court at the right, which predictably was the wrong one which meant I had little or not time to compose and it was now a case of catch what you can. D7000 was on low speed drive, full AF and f8 giving nice quick shutter. From the shots I got I think I basically just get shooting an moving across the blocks till the buffer filled up on the D7000 then I switched to my D90 I had as backup. I managed some wide stuff with the D90 of the emerging dust cloud before switching back to the D7000 for even wider shots of the approaching dust cloud. I knew we were going to be hit by it with the wind direction. Confirmed by the water spray from the damping down that goes on prior to these demolitions drifting over us as well. But, there are times you just have to put up! To get upwind would have meant a lesser view so what’s a little dust? 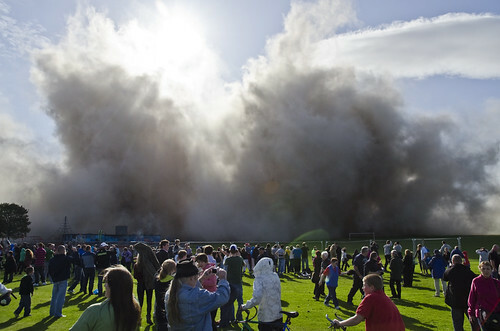 I toughed it out watching the crowd start to panic at the intensity of the dust cloud and decided to save the cameras getting both packed away and heading immediately to the right where the cloud was thinner. It’s not a pleasant experience these dust clouds but thankfully I missed the worst of it and it passed reasonably quickly. It’s quite amusing seeing those who obviously arrived early and parked really close verging on distraught at the covering their cars got, and the amount of wee neds who has kindly scratched their name in the dust on them too. 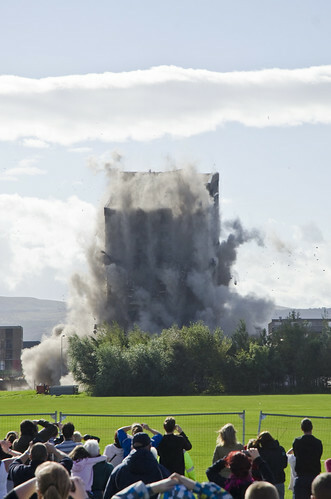 This was a demolition in Sighthill/Broomhouse, if you know Edinburgh you also know there are not the most well to do areas of the city and hence, this sort of thing wasn’t really a surprise! The haul of shots though for the day was reasonable though and the best are below. 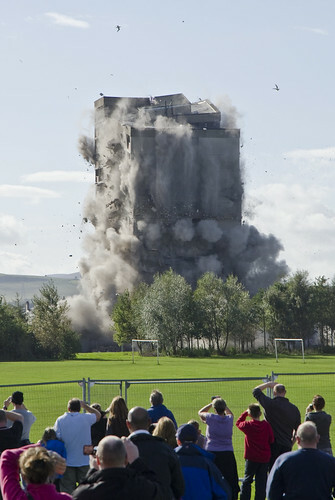 Hermiston Court, this was also the lead image on the BBC News Scotland website for the story. This entry was posted on September 26, 2011 by Grant. 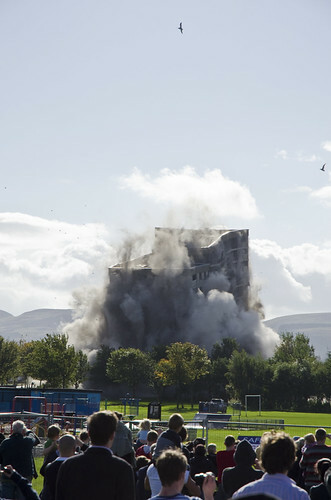 It was filed under Edinburgh, Location Guide, Tips and was tagged with blown up, demolition, edinburgh, glenalmond court, hermiston court, scotland, sighthill, sighthill demolition, weir court. God we must have been 50 m from each other! I was slightly further back at t edge of the trees. I just went for t most westerly tower and had t one camera on rapid fire. I got a fantastic sequence of 6 shots. I used a tripod though and just let the camera fire away. The dust cloud was defo unexpected and got my camera away out t dust as fast as i could. Thang god for quick release plates on tripods! Nice post Grant and cracking shots.